1 Cut the tips off the asparagus to give pieces about 5cm in size. Slice and reserve the stalks. 2 Heat the oil in a large frying pan and fry the onion, garlic and sliced asparagus stalks for 4-5 minutes. Stir in the rice and cook for 1 minute. Add the wine to the pan and cook until reduced by half. Cook gently, gradually adding the hot stock a little at a time and allowing most of the liquid to be absorbed before the next addition. Do this for about 15 minutes or until the stock has been used up and the rice is almost tender. 3 Stir in the peas and reserved asparagus tips and cook for a further 5 minutes until tender. Off the heat, stir in the Parmigiano Reggiano and season to taste. 4 Meanwhile, melt the butter in a small frying pan and fry the sage for 1-2 minutes until just golden. 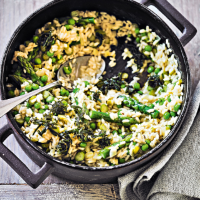 Serve the risotto drizzled with sage butter.